SHARP Lab is partnering with campus groups at UConn (Counselling and Mental Health Services, Freshman Year Experience, and others), as well as local high schools and community groups, to evaluate methods that assist teens and adults in creating a habit of daily meditation. We call our protocol “The 30-Day Meditation Challenge.” Results from our initial study show this program lead to significant reductions in stress, anxiety and depressive symptoms in a group of 140 UConn students. Listen to guided meditations created to assist with the 30-day meditation challenge HERE. Why practice mindfulness and meditation? reduce symptoms of anxiety, depression, loneliness, etc. Meditation is also used by top athletes like Michael Jordan & Kobe Bryant, CEO’s and the military to optimize performance. “Meditation is as important as lifting weights and being out here on the field for practice. It’s about quieting your mind and getting into certain states where everything outside of you doesn’t matter in that moment. There are so many things telling you that you can’t do something, but you take those thoughts captive, take power over them, and change them.” ~ Seattle Seahawk’s offensive tackle, Russell Okung, in an interview after winning the 2014 Superbowl. 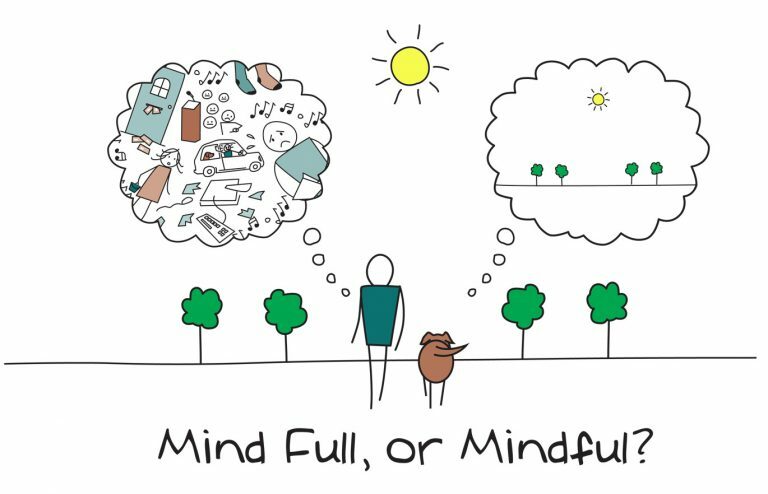 The following blog provides additional details on the benefits of mindfulness, including a section related to college students. Who do you think is stressed, the person or the dog? Why? don’t get mad at yourself when you notice yourself ruminating about the past or worrying about or anticipating the future, this is natural. Just try to notice and catch when this happens, then bring the mind back to the breath, mantra or other object of focus. Over time, this helps us gain a little bit of separation between ourselves and our thoughts, worries or concerns. what does it feel like to be alive right now? what does it feel like to be you in this moment? try practicing everyday, 10 minutes a day for a month, and see what happens! The most basic mindfulness meditation instruction is to sit quietly and focus on the sensations or sound of the breath, and each time you notice the mind wander, bring it back to the breath. **Simple does not mean easy. ** The idea is to do this over and over, using the key elements of mindfulness (especially non-judgement). It might also help to count the breath, such as “in 1-2-3-4-5, out 1-2-3-4-5-6-7” , or box breath ( in 1-2-3-4, hold 1-2-3-4, out 1-2-3-4, hold 1-2-3-4), or whatever count feels natural to you. Mantra meditation provides an additional tool besides the breath that many people find helpful, by giving the mind an internal sound to focus on during their seated meditation. Instructions: Sit in a quiet, comfortable place, preferably with back support. Slowly close your eyes and take a few deep sighs to settle in. You will notice thoughts, streams of thoughts. That is fine. Just observe them without minding them. Take a few long, smooth, deep breaths to become aware of the sensations of the body and help calm the nervous system. After about a minute or two, introduce the mantra “… I AM…” (or “…In…out…” if you prefer), and begin to repeat it gently and effortlessly in the mind. We use the mantra I AM for the sound, not for the meaning. If your mind wanders off into other thoughts or you get distracted from the mantra by anything else, it is natural. When you realize you are off the mantra, gently come back to the mantra. This is all you have to do. Gently repeat the mantra silently inside. The meditation is this simple procedure of thinking the mantra, losing it, and coming back to it. Do not resist if the mantra tends to become less distinct. The mantra can be experienced at many levels in your mind and body. When you come back to it, come back to the level that is comfortable, not straining for either a clear or fuzzy pronunciation. Continue like this for the entire meditation period. At the end of the meditation, take a moment of transition by doing some gentle stretches. Treat this as a time of self-care, before you resume activity. *Note: Most Apps require you to create an account by providing name, email and creating a password. They do NOT require you to pay anything to access the base material, but allow you to ‘unlock’ additional material for a fee. We suggest just using what is available for free. 4. Music, meditation, sleep stories, meditation timer, and meditation focus (stress, anxiety, focus, happiness, etc).